Critics of the Book of Mormon like to dismiss the detailed accounts of Book of Mormon witnesses by saying it's simply impossible to know today what really went on back then. Were there really plates? Did the witnesses really see or touch anything? Was the translation done with careful notes and manuscripts or really dictated verbally, from a hat? Who knows? We can't be sure about much of anything regarding the coming forth of the Book of Mormon. It's all just speculation and group-think from the faithful who may have felt compelled to save face and support the party line. [T]he scripture that he [Joseph Smith] brought into the world (as translator, not writer, Mormons insist) was born in an age of newspapers and before a cloud of witnesses. In fact, before the book was typeset it was drawing defenders and detractors alike. So we probably know more about the production of the Book of Mormon, which is holy writ to the world's 14 million Mormons, than we do about any other scripture. With the Yale University Press publication of The Book of Mormon: The Earliest Text last month, we know even more. We know extensive details pointing to the existence of the plates, the means of dictation, the dates that were involved, the obviously oral nature of the dictation exactly as Joseph and his scribes claimed (made so clear through the analysis of Royal Skousen, including his The Earliest Text), the time of completion, the seeking of the copyright registration and the seeking of a publisher. Details of what Joseph dictated, what his scribes wrote, and what printers typeset have come to light through painstaking scholarship. As Dr. Prothero said, we know more about the coming forth of the Book of Mormon than we do for any other work of scripture, including detailed, reliable accounts from many witnesses who had nothing to gain over their lifetimes by lying or twisting the truth. Several of the witnesses of the gold plates left the Church and Mormon society, yet insisted to their dying day that they had seen the plates and that they were real and divine. But some witnesses were unintentional or even non-LDS. The unintentional witnesses should also count for something. The first unintentional witness of the plates was Josiah Stowell, who apparently took the plates out of Joseph’s hands as he brought them home. He hefted them and later even stated that he saw a portion of the exposed plates. See Anthony Sweat, “Hefted and Handled: Tangible Interactions with Book of Mormon Objects,” in Dennis L. Largey, et al., The Coming Forth of the Book of Mormon: A Marvelous Work and a Wonder (Provo, UT: Religious Studies Center; Salt Lake City: Deseret Book, 2015), pp. 43-59 (relevant passage at pp. 48-49), available at https://rsc.byu.edu/es/archived/coming-forth-book-mormon/hefted-and-handled-tangible-interactions-book-mormon-objects. Another such witness was the brother-in-law of Joseph's wife, Emma Hale. This non-LDS man, Michael Bartlett Morse (1806-1893), had no affinity for the Church, yet on multiple occasions witnessed Joseph engaged in the translation process, as related in an 1879 interview with W.W. Blair, who was then President of the Reorganized Church. The interview with Blair was published in the Saints Herald, vol. 26, no. 12 (June 15, 1879), pp. 190-91, while Morse was still living. You can read the report of the Michael Morse interview in Larry E. Morris, A Documentary History of the Book of Mormon (Oxford: Oxford University Press, 2019), pp. 267-269, a section which fortunately can be viewed at Google Books. A key portion of the interview is shown in the screenshot below, and the text of the full report follows. When at Amboy a few days since, I learned from Mr. Michael Morse, brother-in-law of Joseph the Seer, (he having married a Miss Hale, sister to Sr. Emma), some valuable facts in respect to Joseph the Seer and his work. It should be published that Mr. Morse is not, and has never been a believer in the prophetic mission of Joseph. He states that he first knew Joseph when he came to Harmony, Pa., an awkward, unlearned youth of about nineteen years of age. This was in 1825. Joseph then in the employ of a Mr. Stowell, a man of some wealth, of mature age, and an active professor of religion. Joseph and others were employed by him to dig for a silver deposit, said to have been made at some time long previous. Joseph and others of the company boarded at a Mr. Isaac Hale's, whose daughter Emma he subsequently married. He states that the sons of Mr. Hale seemed opposed to and at enmity with Joseph from the first, and took occasions to annoy and vex him, and that at one of these times, when out fishing, Joseph threw off his coat and proposed to defend himself. He states that Joseph told him that he found the gold plates, from whence it is claimed the Book of Mormon was translated, in a stone box. (Some of late have said that Joseph at first professed to have found them in an iron box). He further states that when Joseph was translating the Book of Mormon, he, (Morse), had occasion more than once to go into his immediate presence, and saw him engaged at his work of translation. 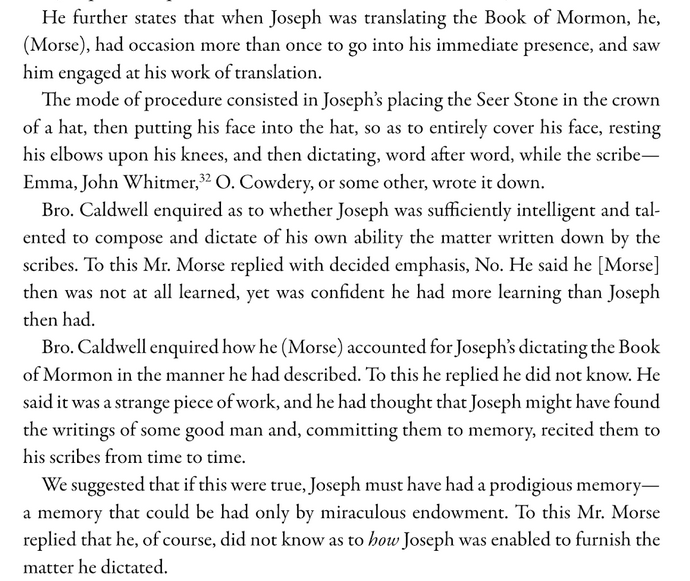 The mode of procedure consisted in Joseph's placing the Seer Stone in the crown of a hat, then putting his face into the hat, so as to entirely cover his face, resting his elbows upon his knees, and then dictating, word after word, while the scribe -- Emma, John Whitmer, O. Cowdery, or some other, wrote it down. Bro. Caldwell enquired as to whether Joseph was sufficiently intelligent and talented to compose and dictate of his own ability the matter written down by the scribes. To this Mr. Morse replied with decided emphasis, No. He said he [Morse] then was not at all learned, yet was confident he had more learning than Joseph then had. Bro. 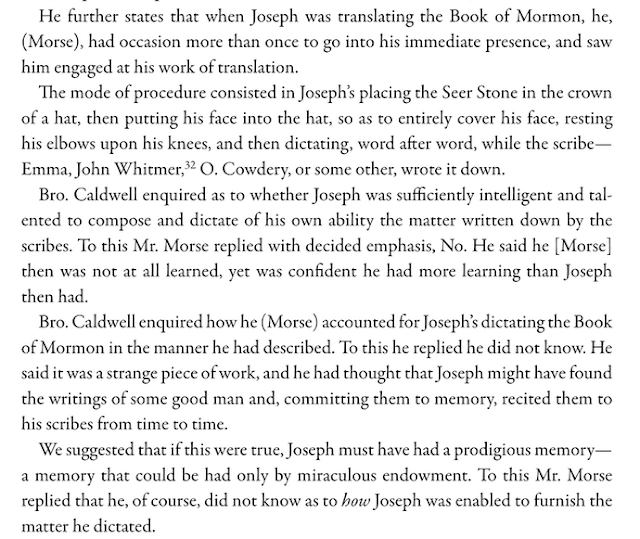 Caldwell enquired how he (Morse) accounted for Joseph's dictating the Book of Mormon in the manner he had described. To this he replied he did not know. He said it was a strange piece of work, and he had thought that Joseph might have found the writings of some good man and, committing them to memory, recited them to his scribes from time to time. We suggested that if this were true, Joseph must have had a prodigious memory -- a memory that could be had only by miraculous endowment. To this Mr. Morse replied that he, of course, did not know as to how Joseph was enabled to furnish the matter he dictated. In speaking of Mr. Isaac Hale and his daughter Emma, he said Mr. Hale always claimed that he was converted from deism to faith in Christ as the Savior, by a secret prayer of Emma's, when she was but seven or eight years old, which he accidentally overheard when just entering into the woods to hunt. In the course of her prayer she besought the Lord in behalf of her father, and the force and efficacy of that prayer entered into his heart with such power as to lead him to faith in Christ the Lord. We are glad to be able to say that the Amboy Saints are in the faith and love of Christ. We had large and attentive audiences to hear us, and we look for a goodly increase in that branch at no distant day. Morse's account supports what other witnesses of the translation process saw. His evaluation of Joseph's education is also worth noting, as is the shear implausibility of the only method he can propose for how Joseph did the dictation of the Book of Mormon. To his credit, his theory that Joseph memorized and regurgitated large chunks of text is still frequently relied on today, though still without a plausible explanation for where the memorized text came from in the first place. Honestly, if the book is a fraud from the nineteenth century, someone in that era had to come up with intricate details like multiple Semitic wordplays or the River Laman and Valley Lemuel three days south of the beginning of the Red Sea, then the burial place Nahom/Nehem along a south-southeast trek, and the existence of a miraculous Bountiful due east of Nahom--so who gave us those gems and how? Joseph's awesome memory regurgitating the words of a secret manuscript writer on the frontier doesn't get us past 1 Nephi 1. In the summer of 1830, after Joseph Smith was charged with disorderly conduct, Stowell was called by the defense and sworn in as a witness. He testified under oath that he saw the plates the day Joseph first brought them home. As Joseph passed them through the window, Stowell caught a glimpse of the plates as a portion of the linen was pulled back. Stowell gave the court the dimensions of the plates and explained that they consisted of gold leaves with characters written on each sheet. The printed transcript of the trial read: “witness saw a corner of it; it resembled a stone of a greenish caste.” Because Stowell also mentioned in his statement that the record was made of plates of gold, it is difficult to know what he meant by this description. He may have seen the band that sealed two-thirds of the plates together, which may have been made of copper that had oxidized over the years and turned green. Alternatively, he may have seen the breastplate, which could have also been made of copper and appeared green from oxidation. In any case, the point Stowell made to the court was that the plates were real and that he had seen and felt them. Stowell thus becomes the first unintentional witness, having an experience somewhat like that of the formal Eight Witnesses later had as they were allowed to heft and see the plates. Footnote 25 cites the letter of Martha Campbell to Joseph Smith, December 19, 1843, Church History Library, Salt Lake City. The author observes that "Because both Lucy Smith and Josiah Stowell were present when Joseph handed the plates in at the window, perhaps they both helped or carried them simultaneously." Footnote 26 cites Michael Hubbard MacKay and Gerrit J. Dirkmaat, From Darkness unto Light (Provo, UT: Religious Studies Center; Salt Lake City: Deseret Book, 2015), p. 13. Update, March 12, 2019: I initially was thinking that Josiah Stowell was also non-LDS, but I apologize for forgetting that he joined the Church in 1830, though did not migrate with the Saints when the left the New York area. He expressed a desire to go west and be with them, but circumstances prevented that. He remained a believer in the Book of Mormon. One of the more popular "easy" arguments to dismiss the Book of Mormon is that the name Alma is a woman's name. Many critics have pointed out that it's a Latin female name, and some have also argued that while it may be a Hebrew name, it's a woman's name in Hebrew, making the Book of Mormon's male character of that name a dead give-away for Joseph Smith's fraud. Robert Boylan discusses a recent case of this argument being used to summarily dismiss the Book of Mormon. The sad thing is that we could have been celebrating this find over a decade earlier, for Yadin mentioned "Alma son of Judah" from that ancient document much earlier in a 1961 publication. If LDS readers had only noticed, then today we could complain about our critics being nearly 60 years behind on Book of Mormon scholarship rather than nearly 50 years behind. Such a lost opportunity. As Boylan explains, Alma is also attested in other documents as a legitimate ancient Near Eastern name, but I especially like the clarity of "Alma son of Judah" from the Bar Kokhba Letters. Many popular arguments against the Book of Mormon have had similar surprises. Not all, but many. Alma not only goes from being a disastrously bad choice of a made-up name to a plausible ancient Hebrew man's name (something that ought to raise a few eyebrows), but the apparent meaning of the name is played upon several times in the Book of Mormon text in the manner of Hebrew word plays, something that occurs with a large number of names in the Book of Mormon, as Matthew Bowen has shown (regarding Alma, see this 2016 article and this 2017 paper). There's always more than meets the eye in these Book of Mormon issues. Always worth digging more. Latter-day Saints often say that the Book of Mormon is obviously highly unusual since this complex text was generated in such a short period of time by a relatively uneducated young farm boy. But in making these assertions, we often may be relying on what we've heard from others without considering the details of how it actually compares to other works in literature. Just how unusual is it? Our critics these days often point to other works to show that others (e.g., Tolkien) have done similar things. So is it really unusual? Brian C. Hales gets into solid data and considers the multiple dimensions of the Book of Mormon to help all of us better understand what is going on with the Book of Mormon. I strongly encourage you to read "Curiously Unique: Joseph Smith as Author of the Book of Mormon," just published in The Interpreter: A Journal of Latter-day Saint Faith and Scholarship.